The 12 gauge is America's most popular shotgun. With the right ammunition, this versatile gauge is great for hunting, target shooting and even self defense applications. You can trust anything that comes from Federal as they have been producing premium products since 1922. 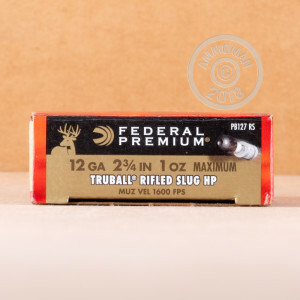 With the experience and quality Federal brings to the table, these Truball slugs are just what you need for your next day out in the field hunting with your favorite shotgun. 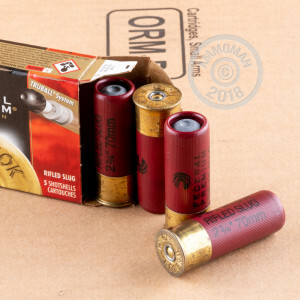 These 2 3/4" hulls carry a one ounce hollow point slug that exits the barrel around 1,600 feet per second and delivers hard hitting knockdown power perfect for deer and boar hunting. Do you need more than 5 rounds? At AmmoMan.com all orders over $99 will ship for FREE! So stock up on all your calibers and save!